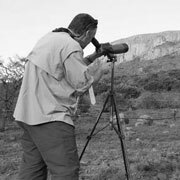 Dave Allan is one of the most experienced field ornithologists in South Africa, and one of the region’s best-informed and most impassioned bird conservationists. Over a career spanning more than 30 years, he has fronted some of southern Africa’s most comprehensive and influential bird population studies. These have included raptor, crane, stork, ibis and lark surveys in the former Transvaal, bustard and crane work in the Overberg and Karoo, montane raptor and vulture counts in the Lesotho, and waterbird and vulture surveys in KZN and the Eastern Cape. He now works as the Curator of Birds at the Durban Natural Science Museum. As his long-time friend and mentor, Dave has collaborated with Andrew Jenkins on many projects, including a series of bird distribution and conservation studies in the Lesotho Highlands. He is an active member of the BirdLife South Africa Taita Falcon Survey Team, serves on the BLSA/EWT Birds & Wind Energy Specialist Group, and is a wise and much-valued advisor to AVISENSE. 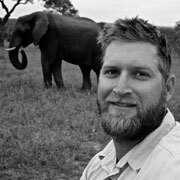 Lucien Beaumont is an experienced safari guide, having worked for eight years as a senior guide at Londolozi Game Reserve. He is now pursuing a career as a freelance game, bird and photographic guide, and has plied his trade in a wide variety of settings across southern Africa. 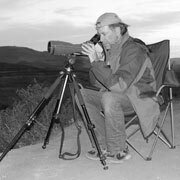 He has also assisted with formal scientific studies of African carnivores, and is a skilled photographer as well as a very capable birder with exceptional powers of observation. He joined the AVISENSE team in 2015, and is currently sub-contracted as an avifaunal monitor, doing pre-construction survey work at proposed wind farm projects. 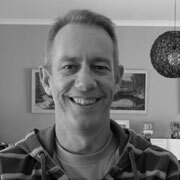 Grant Benn’s professional career as a GIS consultant started in early 2000, working as a technical and GIS analyst with TerraMare Environmental Data Systems, GIMS (now ESRI South Africa) and GISCOE. In 2005 he started GeoCline Consulting cc, specialising in spatial data and systems development and analysis, and two- and three-dimensional spatial modelling, and working for a wide variety of clients. Grant has authored and co-authored numerous scientific articles and symposia papers on a variety of conservation and GIS-based topics. 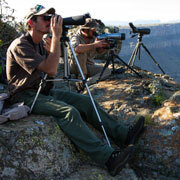 GeoCline Consulting has provided top-end GIS expertise to AVISENSE since the company started, contributing to multiple commercial studies of avian distribution, movement and collision risk, as well as to academic studies of foraging ecology (Peregrines), and habitat selection and distribution (Taita Falcons). Given the importance of accurate spatial analysis to the outcomes of many avian impact studies, Grant and GeoCline are integral to maintaining AVISENSE’s excellent service offering. 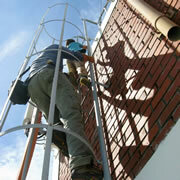 Visit Grant's homepage for more about Geocline Consulting. As a husband and wife team, Mark and Amanda Dixon have a wealth of experience in the collection and application of ecological data, through their involvement in projects varying from marine fisheries surveys in South Africa, to crocodile research in Central America. 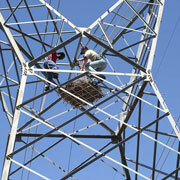 Since August 2010 they have conducted pre- and post-construction bird surveys at 17 renewable energy sites throughout South Africa. By combining their passion for birds with their post-graduate scientific research skills, Mark and Amanda deliver top-quality, comprehensive, accurate and insightful avifaunal data, gathered strictly in terms of the BLSA/EWT best practice guidelines, for use in impact assessments of proposed new wind and solar energy developments. Shane holds a BSc (Zoology and Psychology) and Post-graduate Diploma from Massey University, North Island, New Zealand. During his student days he did stints as an assistant on various research projects and developed a wide range of associated ornithological field skills. 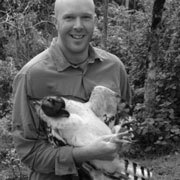 He has worked on falcon ecology and conservation in New Zealand and Mongolia, parakeets in Mauritius, Scops Owls on Pemba Island and Crowned Eagles in Kenya. He also spent four years working at a wind energy project in New Zealand, assisting with a study in which radar and bioacoustics were used to understand waterbird movement patterns and turbine collision risk. He came to South Africa in 2011 and registered for an MSc at the University of KZN, studying the ecology of urban-breeding Crowned Eagles. This research, which he is now continuing as a PhD, has included trapping, marking and tracking eagles, and using various other innovative technologies to understand movements, habitat use and diet in these elusive birds. 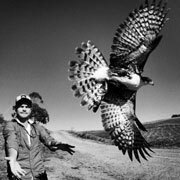 Shane is an active member of the BirdLife South Africa Taita Falcon Survey Team, and is part of AVISENSE Consulting's team of specialist field workers. 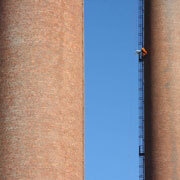 For more information on Shane’s project see his blog. Megan is currently completing her PhD in Zoology at the University of Cape Town. Her research has focussed on the foraging ecology of Verreaux’s Eagles (under the co-supervision of Andrew Jenkins), using harness-mounted GPS-logging devices to gather high resolution spatial data, tracking the birds’ ranging behaviour in relation to habitat and topography. 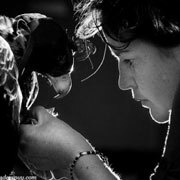 In the course of this demanding study, Megan has developed considerable expertise in trapping and tracking large raptors - scarce but essential skills for determining movement patterns and collision risk in these impact susceptible birds. Megan will soon be teaming up with AVISENSE to bring these skills to bear in assessing and mitigating the impacts of proposed new energy infrastructure. For more information on Megan’s project see her blog. Gareth completed his Honours in Zoology at UCT in 2011, looking at the physiological adaptations in European Rabbits that allow them to survive on resource limited islands off the south west coast of South Africa. 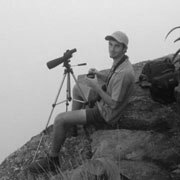 He joined the Percy FitzPatrick Institute of African Ornithology in 2012 to begin a Masters investigating plumage polymorphism in Black Sparrowhawks on the Cape Peninsula. This work used a variety of genetic techniques to understand the genes that play a role in plumage colour in the species. In addition, with the use of remote nest cameras and miniaturized GPS loggers, he investigated the movement, behaviour and hunting success between the two morph types found in this species. He upgraded to a PhD at the beginning of 2014, and has expanded his study to include the rest of South Africa, where he has begun to analyse the population genetic structure of Black Sparrowhawks to further understand their polymorphism and recent range expansion. Gareth has also been involved in bird monitoring for several wind energy facilities in the Western Cape, and is currently completing his FGASA course to qualify as a field guide. For more information on Gareth’s project see his Facebook page. Kyle studied a diploma in Nature Conservation at NMMU, Saasveld campus. As part of his final year of diploma he was to complete an experiential training year in the bush. During this practical year he spent as much time as possible conducting a raptor community survey on the reserve, locating nests and determining the breeding success of several different raptor species. It was during this time that he first met Andrew Jenkins and started to help out as a field assistant on the Peregrine Falcon research project on the Cape Peninsula. 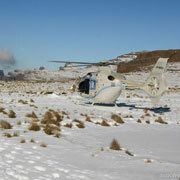 He has subsequently joined the BirdLife South Africa Taita Falcon Survey Team. Kyle is currently busy with his BTech studies at Tswane University of Technology, conducting a two year research project on the African White-backed Vulture population on a reserve. He is a fit, keen-eyed and increasingly capable member of the AVISENSE research and consulting team.